This is a quiz that contains NCLEX review questions for nephrotic syndrome. As a nurse providing care to a patient with nephrotic syndrome, it is important to know the signs and symptoms, pathophysiology, nursing management, patient education, and treatment. In the previous NCLEX review series, I explained about other renal disorders you may be asked about on the NCLEX exam, so be sure to check out those reviews and quizzes as well. Don’t forget to watch the nephrotic syndrome lecture before taking this quiz. 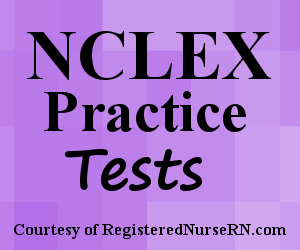 This quiz will test your knowledge on nephrotic syndrome in preparation for the NCLEX exam. A. An 8 year old male with diabetes mellitus. B. A 5 year old female diagnosed with minimal change disease. C. A 10 year old male with Lupus. D. A 7 year old male recently diagnosed with Goodpasture's Syndrome. 1. A 6 year old male is diagnosed with nephrotic syndrome. In your nursing care plan you will include which of the following as a nursing diagnosis for this patient? The answer is A. A patient with nephrotic syndrome is at risk for infection due to the potential loss of proteins (immunoglobulins) in the urine that help fight infection. In addition, medication treatment for nephrotic syndrome may include corticosteroids or immune suppressors, which will further suppress the immune system. Option B is wrong because the patient will be experiencing fluid volume overload (not deficient). Option C and D are wrong because constipation and overflow urinary incontinence are not common findings with nephrotic syndrome. 2. Which patient below is NOT at risk for developing nephrotic syndrome? D. A 7 year old male recently diagnosed with Goodpasture’s Syndrome. The answer is D. The patients in options A-C are all at risk for nephrotic syndrome. The patient in option D is at risk for acute glomerulonephritis. The answer is C. The urine will appear dark and foamy due to the high amount of proteins present in the urine. Remember in nephrotic syndrome the patient is losing a massive amount of protein per day (3 grams per day) and this will cause the urine to foam. The answers are B and D. The patient will NOT experience weight loss but weight GAIN as a sign of relapse with this condition. In addition, the urine will appear dark and foamy. Tea-colored urine indicates there is blood in the urine, which is NOT common with nephrotic syndrome. The answers are A, E, and F. The patient with nephrotic syndrome will experience massive proteinuria (not slight) along with low albumin in the blood (hypoalbuminemia), edema, and high cholesterol and triglyceride levels. It is not common for the patient to experience tea-colored urine or hypertension (rare) this is very common with acute glomerulonephritis. 6. You’re providing care to a 6 year old male patient who is receiving treatment for nephrotic syndrome. Which assessment finding below requires you to notify the physician immediately? The answer is B. Patients with nephrotic syndrome are at risk for hypercoagulability (blood clot formation) due to the loss of proteins in the urine that prevent blood clot formation. Option B represents a possible deep vein thrombosis, which will appear as a redden, warm, and swollen area on the extremity. Options A, C, and D are common findings with nephrotic syndrome, which are expected. 7. As the nurse, you know that it is important to implement a low sodium diet for a patient with nephrotic syndrome. However, it is important to implement what other type of diet due to another complication associated with this syndrome? The answer is B. Patients with nephrotic syndrome can experience hyperlipidemia. Why? Remember that in this condition there will be low amounts of albumin in the blood. This decrease of albumin in the blood causes the liver to make more albumin, BUT while it does this it also makes more cholesterol and triglycerides…hence increasing lipid levels. Therefore, the patient should follow a low-sodium and low-fat diet as well.